This day commemorates the life of John the Baptist, a Jewish preacher who baptized Jesus in the Jordan River and is a symbol of French Canadian pride and heritage. Many centuries ago, as Christianity spread through France, celebrations for the summer solstice began to merge with Saint John the Baptist's feast day, June 24. This new French celebration was brought with the French Colonists to Canada however it didn't quite catch on immediately. It wasn't until 1834 that the Montreal Saint Patrick's Day celebrations inspired a man named Ludger Duvernay to create a similar celebration for French Canadians. So, in 1843, he established the Saint John the Baptist Society in an effort to promote the day's festive celebrations and in 1880, the same Society organized a National Congress of French Canadians. 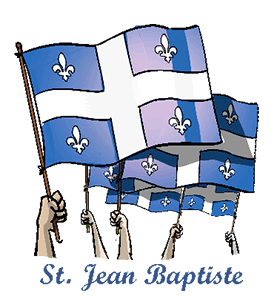 Finally, in 1925, St. John the Baptist Day, known as Saint Jean-Baptiste Day, was recognized as a provincial holiday in the province of Quebec. In the years that followed, the celebration focused very little on St. John's feast day but more on the identity and culture of French Canadians, something that eventually led the Quebec Government to declare Saint Jean-Baptiste Day as the Quebec National Holiday in 1977. This is an annual statutory holiday and is only observed in the province of Quebec on June 24. The official colours for this celebration are the colours of Quebec's flag: blue and white! This celebration in Canada is referred to as La Saint-Jean. St. John the Baptist is the Patron Saint of French Canadians. St. John has two feast days in the Roman Catholic Church. The first, held June 24, acknowledges his birth. The second, August 29, commemorates his death. In the Orthodox Church, 'The Nativity of the Venerable and Glorious Prophet and Forerunner John the Baptist' is held on June 24. In Mark 1:7, John is described as wearing camel's hair and eating only locusts and honey. Enjoy something with honey to honour John the Baptist. Wear blue and white, the colours of the Quebec flag. Attend two of the largest Quebec parades in Quebec City and Montreal. Enjoy traditional Quebec foods such as poutine (fries with cheese curds and gravy), tortiere (a meat pie) and maple syrup! Take the opportunity to practice your French in Quebec. It's the official language in the province of Quebec and since most residents are fluently bilingual; it's a great opportunity to practice.